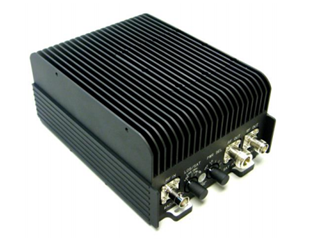 The AR-50-SAT75 RF booster amplifier operates at 50 Watts PEP, 30 - 512 MHz and 75 Watts PEP 220 - 324 MHz and is ideal for integration into tactical radio equipment. The AR-50-SAT75 uses six high speed auto switching filters to assure harmonic suppression and is SINCGARS, HAVEQUICK, HPW, DAMA, IW, and ANW2 compatible. The AR-50-SAT75 portable, lightweight, fully automatic band-switching amplifier features 24 V vehicle power supply Voltage Spike, a noise suppression DC line filter, RF sensing, T/R switching, Automatic Level Control (ALC), protection against antenna mismatch, protection against over-temperature, and protection against accidental polarity reversal. Protection against accidental polarity reversal is provided. The amplifier comprises a rugged 3-piece aluminum case. For more information on general, environmental, and mechanical specifications for the AR-50-SAT75 RF booster amplifier, download the datasheet.